The Cure – Ejekt Festival 2019 Concert Trip. In 2019, EJEKT Festival completes 15 years of fun and celebrates it with an anniversary line-up. The first name to announce is the famous The Cure, one of the greatest names of modern music! 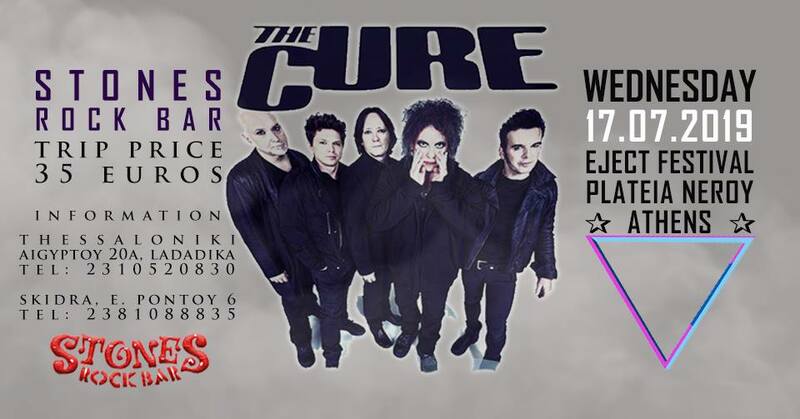 The Cure will return to Greece after more than a decade as part of their long-awaited European tour that celebrates the 40-year presence of the band. The Cure’s successes are so many that almost every listener has – consciously or not – connected at some point in his life with a song of their own. There is no artist or band that would not want to have written a song like “Friday I’m In Love“, “Just Like Heaven“, “Boys Do not Cry” , “Lovesong“, ” Close To Me “and more. You can book your Trip Now @Stones_Rock_Bar.